So first I’ll tell you what the challenge is and how it works. The Fearless Songwriter Challenge that I participated in was online and was conducted in the form of a Facebook Group. Explained simply, you are “challenged” to write a song a day for seven consecutive days. There are lots of rules, the details of which are not that important to the story. I will ball them up and tell you that each day right around midnight a prompt was given on the Facebook group for that day’s challenge. The prompts could be verbal, visual or musical and you were not required to use them, but I can say from my own experience, they helped a lot. Another “rule” was to write something fresh everyday. In other words, we were encouraged NOT to try and finish already started pieces, but to be brave and see if the process would birth completely new songs. Once your song was completed, you were then asked to post it on the Facebook group. For me this meant performing it live into the voice memo App on my iPad, and then doing the unthinkable; posting it unedited and raw for the world to hear. The last rule, which wasn’t stated, but will be incorporated for future challenges because of my very public faux pas was, since the songs were posted in their virgin form and pretty much all were recorded very low-tech, no feedback other than whether you liked the song should be posted. Now you may not know this, but I’ve been attending the Jack Hardy Songwriter’s Exchange in NYC on and off now since 2011. The whole point of that group is to bring in a new or in-process song each week with no explanation or introduction and then leave yourself open to feedback from the group. This is not the point of The Fearless Songwriter. It’s more about the commitment to actually write everyday for seven days without the creative process being questioned by someone else’s suggestion(s). My bad. I jumped in giving comments and suggestions. As soon as I was very politely and privately told of my error, I apologized publicly to the group. I admittedly felt kind of stupid, and was very relieved to be responded to with kindness and acceptance. The moderator of the group also offered some helpful suggestions such as trying to allot yourself no more than 45 minutes to write, and that in his experience early morning is the best time to write. He also suggested that as soon as you felt the song was “complete” even if complete meant a rough draft, to be done with it. I of course did not adhere to any of these suggestions. My shortest writing experience was 40 minutes, but most took around 2 hours. As far as the time of day, with a full time job and a complicated life, I never wrote early in the morning and very often found myself under the gun trying to get the song posted around 11pm. I also never felt comfortable posting a rough draft. If I was posting it, it had better be a pretty fleshed out idea even if the recording and performance was rough. It was a whirlwind, and I confirmed for myself that I am in fact an adrenaline junky, just not the kind that physically jumps from buildings, but does so creatively. I will be honest and say at first I was disappointed. I expected a verbal prompt but decided to stop trying to control everything and just see if I could actually write something. Thankfully day one was a Sunday. A good way to ease into the process without having to find the balance between real life and being creative, which is a constant struggle for me. I stare at the painting. Nothing. I go for a run…a melody emerges with some words. “She was happy then.” I realize that I’m connecting to a photo of someone from my past of when they were young and carefree that for some reason the painting reminds me of. Voila, I’m on my way. I must preface this by saying, in general when I write a song, I’ll “demo” it on my iPhone or iPad just to have a reference, and quite frankly to remember how it goes. Once written I will practice the dickens out of it until it becomes physically natural. WIth this challenge, there was no time for this. You write, you record, you post. It’s out there. It is really scary to know that it and/or I can be so easily judged, but I committed, and I fulfilled day one. I didn’t just fulfill the challenge, I loved the song. I mean really, truly loved it, as if it were a savior in musical form. I have written a complete song. The curse is broken. I am allowed to continue for another day (that’s the drama I hear in my head speaking, and yes, it is overly dramatic, and I’m learning to stop judging my judging of myself). Day Two. I have to work, food shop and do some posters for upcoming shows. How the heck will I be able to write a song? I feebly surf over to the Facebook group to get today’s prompt. It is ‘What I/I’ve never told you.” Great. I not only have to see if I can write something, it has to be revealing and personal. As if this is a new notion, again, I am fighting it. The storm in my brain tortures me for a bit and then, just like a sudden breeze on a fry-an-egg-on-the-sidewalk day, relief. It flies out of me. Now the question remains, do I just post, or do I explain who I’m talking about and why? I decide to just post. It’s called “If You Only Knew” and Gian my husband thinks it’s one of the best songs I’ve ever written. Day Three. I’m feeling good. I have a mash-up of “She Was Happy Then” and “If You Only Knew” in constant rotation in my brain, and normally this would distract me. Generally when I write, the current new one is on a continual loop inside my brain until the next one comes. This was different. Both new songs were swirling around but I had a feeling that I could get there again. The prompt for this day was “What do you hear in the quiet” and I had to laugh because quiet is an abstract concept to me. I decided to once again just let go of my preconceptions and see what emerged. I must note that this day was more hectic than usual. I was doing what is known as a “ride-along” for my day job (I’m in complete denial but most of bills these days are paid by my being a broker in the natural food industry). Basically, I was responsible for taking a vendor around NYC & Brooklyn to meet with my biggest clients. I had to be on the road at 8am, and just being brief, my morning routine includes: upper body work-out, running 2-3 miles, answering any pressing emails from the previous day and packing bags with products for the clients I would see that day. I woke up at 6am and knew that I would probably not return home until after 7pm. Sure, I could write a song, record it and post it by midnight. Oy. I returned home exhausted but still had a nice dinner with my husband, watched an episode of “Newsroom” while we digested and then headed down into the studio to see if I could make this happen. What do I hear in the quiet? I kept asking myself that question and then the answer seeped in. I hear my knowing that my husband loves me unconditionally. I hear our hearts beat in synch even during the tough times. There it was. The first love song I’ve written for my husband since probably our wedding song (we were married 18 years ago this past May). It’s catchy without being hokey and I love this song. I’m on a roll and I’m starting to feel some small sense of optimism that I will be able to do this. Day Four. The prompt is “Think of a hero and then think of who their hero is and write about them.” I’m stumped. My Dad is a hero, but who is his hero? I liked Captain Kirk from Star Trek, but who would I write about? Captain Pike his predecessor? Nothing is clicking. I’m nervous. The ensuing dialogue in my head goes something like this: “See? I jinxed myself. I was cavalier. I don’t have this, I’m a failure. No wonder I’m not more successful.” Yikes! I know, I scare myself sometimes. I talk myself down from the ledge and assure myself that every song doesn’t have to be a masterpiece, in fact the moderator said himself “If you get one great song out of this exercise, you’re really lucky.” Of course, I don’t believe any of this for a minute. I have to write something, and it better well be great! Again…oy. The day is a blur of clients and to-do lists and I keep wondering, do I even have an actual hero? I have musical heroes, but purposely know little about their process or personal life. I never want to poach anything from them other than being inspired by their musical greatness. And then it hits me. I can be light. I can be funny-right? I remember how as a kid all the young girls in elementary school dreamed about growing up and becoming Marcia Brady. I of course idolized Jan. I could relate to her and her awkwardness. Her glasses and less than perfect hair. Jan was my hero and of course Marcia was hers. Song four done….and then I got the phone message…. Day Five. I’m tired. I’m cranky. Why in the world did I take on something that would add even more pressure to my life? The night before I received some less than happy news and it was all I could think of. The day’s prompt was not helping. “Write something that pedals one bass note.” What? No words, no pictures, just a bass note. Ugh. The inner dialogue started up again; “Do you really think this is going to make a difference anyway? Big deal, you wrote a bunch of songs. Who’s going to hear them?” I drag myself downstairs and sit at the piano. I realize that the first four songs were in four different keys using the white keys on the piano. Hmmmm. I hadn’t written in E yet. So I pedal E. The song literally writes me. 40 minutes later I’m reduced to tears. The song is done. It’s as near perfect as I can imagine and I have no idea how I will possibly be able to sing it all the way through without breaking down. It is so potent. I play it for Gian. I cry, collect myself and record it and post it. Day Six. It’s Friday. After today there is one day left and so far I have what I consider to be four keepers and a fifth possible keeper with tweaking. I believe I’m going to make it. I will be honest and say, at this point, I just want to finish. I am not overly concerned with the quality of the last two songs, just that they get done. I didn’t feel like I was coping out. I felt more like I was tapped out. The prompt is “Steal a great first line from a song.” I don’t like this. It goes against my ethical and moral code. I don’t steal, I try not to even borrow from other people’s music. I realize that there are only so many combinations of words and notes and that they’ve probably all been done before, but to consciously do so felt very wrong. I’ll just write something…and nothing comes. I resort to going on the internet and Googling “The Top 100 Best first Lines of Songs” just to see if anything even inspires me. It doesn’t. It’s gray and gloomy out and I am feeling extremely overwhelmed an unmotivated. I decide to trek downstairs to the piano and decide to figure out what keys I haven’t written in yet. I’ve got B & C left. I decide C and start tooling with a chord progression. And then it happens. The room lightens up because the sun literally came out, and yes, the first line is “Here comes the sun” and continues “though I never believed it was really gone.” I am amusing myself at this point and I do it. I complete song six. Gian comes home from work and he very generously asks to hear it (I say generously because he’s exhausted and I know would rather zone out in front of the TV). I play it for him. He likes it, but thinks the chorus can be a little more sophisticated and more appropriate in relations to the verse changes. Alrighty, I can fix this…and I do. I record, post and breathe. One more day. The prompt for our final day is to “Google image search for your favorite visual artist, and try to describe something from all the images that you see as if there are one. Better yet, try it for your least favorite artist.” Well I know right away I’m going to be searching Dali. I love many artists, but there is something about his work that I relate to on such a deep level. Of course, being in the Google environment I made the mistake of reading a bit about his history. Bad move…I don’t like him as a person. Ok, let it go and look at the art. We have two pianos in our home. One is the Baby Grand Baldwin I bought myself a few years ago when I built the studio. 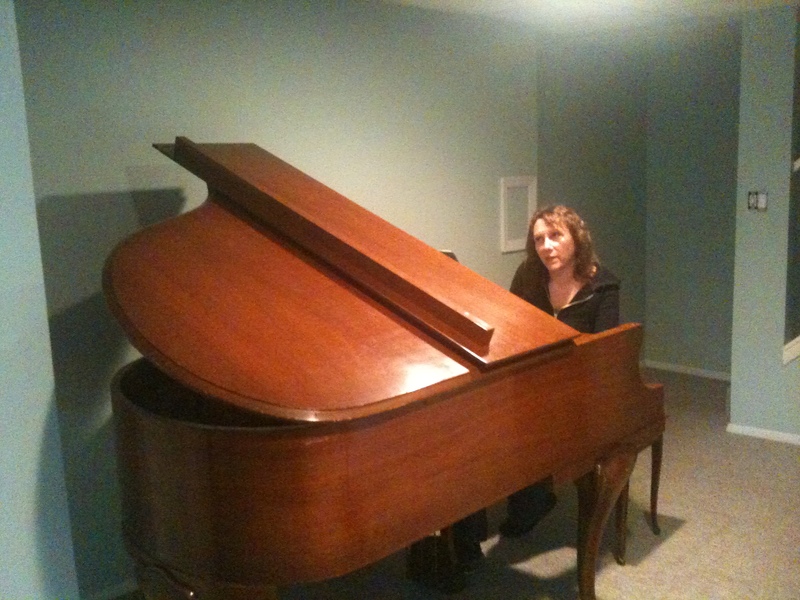 The other is my childhood piano. It was the first and only until I got the Baldwin and I’ve written probably 80% of my songs on her. Ironically above her on the wall hangs a print of Dali’s “Musical Tempest” that I bought for one of Gian’s birthday’s. Click here to see. I’ve always loved this painting and particularly relate to the figure that I have deemed a woman in the shadows carrying a boulder on her head. She’s me, or at least a version of me that I connect with. I have one key left that I haven’t written in. The dreaded key of B. It never feels natural. I always want to migrate to Bb or C, but I really want this to be my extra cool little twist, so I commit. I also realize I haven’t written a waltz yet, and again, there it is. “Never asked To The Party” is my seventh song of a week long remarkable journey. I don’t think it’s a brilliant piece, but I also don’t think it stinks. I’ve done it. I am free to go out and socialize with friends! A quick aside. Saturday night we had plans to have dinner with my in-laws and then hang with our friend Danielle because her sister Laura was in town. I had my contact lenses in and was actually semi presentable. Unfortunately when I went to record the song, I realized that I couldn’t see with my contacts in. I scour the house for my “reader” (you have no idea how horrifying it is to type the word READERS in conjunction with me, but there I did it. Another gesture of bravery). So I try to record but the problem is, I can sort of see the lyrics and chord changes, but I can’t look down and see my hands because I start getting waves of nausea because of the readers. I need to glance occasionally-I don’t know this song by heart, it’s not simple and it’s more of a security thing. It takes me OVER AN HOUR to record the darn thing because I have to keep taking the readers off to drink water and settle my stomach. Needless to say, we were late, but I posted before midnight. Here are the resulting songs from my first ever Fearless Songwriter Challenge. I suggest you read the prompts in the description and listen in the order they were written, or not. I welcome your feedback, sort of. Truth be told, I do kind of want to stay in this place of accomplishment, but yes, please feel free to share with me any thoughts, feelings, etc. You may also feel free to share this blog if you think it might inspire or be interesting to a friend!